October 20th, 9:45 PM Israel is Still UP and At It! Praise the Lord , Israel is up and doing well. He has been sleeping up to 15 hours a day which has been helping with his continual recovery. He went to his house again and spent time with the electricians today . He is not able to sit up too long yet but gains a little strength every day. Cori is doing well and enjoying her days out of the hospital setting . She is faithfully caring for her husband making sure he gets his pills even in the night! Israel and Cori are enjoying their little Sheltie dog, “Suprise”. She is a bright spot in their long days and she loves Israel’s lap! Israel was very excited to find a computerized prosthetic leg that someone has donated to him! It is getting mailed to him soon. 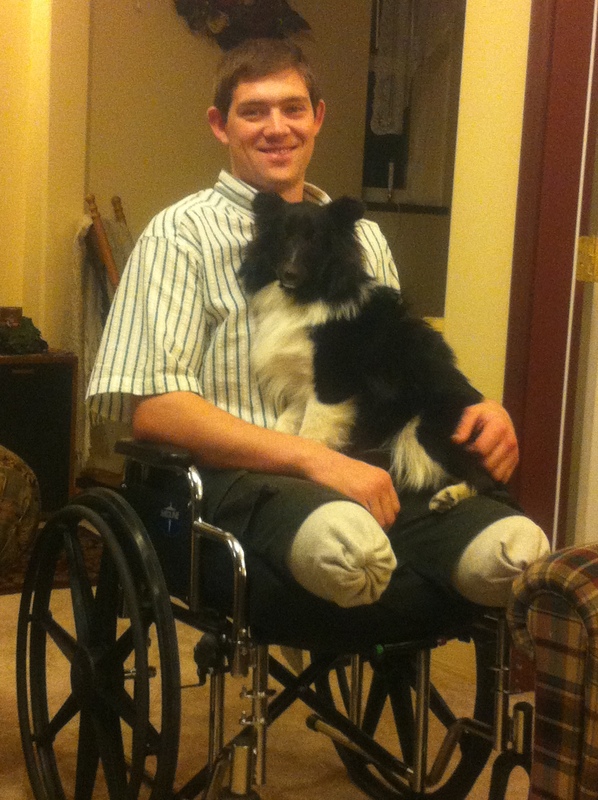 He is hoping to find another prosthetic for his other leg. This person heard of Israel’s situation and was pleased to be able to pass it on to him. Every opportunity he finds to have the future of legs he “jumps at”! A thought for today: ” Every good gift and every perfect gift is from above, and cometh down from the Father of lights,, with whom is no variableness, neither shadow of turning.” James 1: 17 The Lord loves to give good gifts to His children and Israel and Cori are experiencing the Lord’s goodness in special ways every day. Puppy love is very healing! Keep up the good work!! So thankful for the updates & pictures, & for your incredible strength! How we look forward to these updates on Israel and Cori. Thank you for taking the time to blog the m. Also thanking the Lord for the continual encouragement as we hear of the faithful response of Israel and Cori to a most difficult life situation. We wondered, when our son Jon moved with his wife and children from MI to Alaska, what the Lord had for them there. It broke our hearts to see them leave, we miss them terribly, and yet we rest assured God has a plan and a purpose for them and it is most certainly in His will for them to be there. We are comforted in the LOrd’s goodness, knowing that had our family not moved to Palmer, they would not have met Israel and Cori and the extended family. Your lives have touched theirs, and made an impact. And by association, ours too. Praying God’s continues blessing and provision for all of you. Though we have never met, you feel like the family that we are….Because of that bond in Christ. We thank God for His mercy toward Israel and Cori and all that love them. God is at work… conforming each of us that love Him into the image of Christ. Thank you, Israel and Cori, for allowing God to use you in this way. You are bringing Him great glory through your willingness to be “on stage” and faithfully letting the love and life of the LORD Jesus to shine through you to all that are watching! We are following your updates and praying for you as you walk this difficult road. May God be glorified as you find your hope, strength, peace, and joy in Him!!! So encouraging to see your progress! Just want you to know that we are keeping updated and praying for you! I once heard a quote… “God gets his best soldiers out of the highlands of affliction.” I have no doubt that you are mighty soldiers for Christ, and that you shine ever brighter for Him as a result of your trials. Israel and Cori, Your strength and faith at this difficult time in your lives is a true inspiration for all of us. So glad to hear that you are doing better now, and I know that before long, you will be walking on new legs. Or should I say, running? Best to both of you.